I love Etsy! Seriously LOVE it. If you're looking for anything that you may not find in a store, check there first. I checked out bump2baby and fell in love with her Black and Green Reversible Maternity Skirt. NO I am not pregnant, but I loved it. She sent it to me and I love it even more. The best part? It has a 7" wide stretchy waistband. So it accommodates a pregnant belly or a before and after belly. I love that it fits me now, but will stretch to fit me if and when I get pregnant again. It has a little pink tag in the back to let you know that is the back. The green side has a black border at the bottom, and the waistband is all black! I got this skirt in a Small which says hips 38"-42" I have 36" hips so I thought it might be big, but it fits me quite well. Honestly I don't think it would fit a 42" hip. But I have the small and it fits me great. These are obviously handmade and I had this skirt in just 6 days from the conversation. Pretty happy about that. But I love the way this skirt fits. I love that it's reversible so 2-in-1. I love the material, like a women's dress shirt material. And I love the stretchy band that stretches!! Love this skirt! She has so many other beautiful skirts to choose from, as well as some baby slings, and diaper and wipe cases as well. Price: Her reversible skirts are $35. Her regular skirts are $22 and her Slings are $31.45. These are all very reasonable prices! Overall: ***** Happy with this skirt. I love it! She has tons of cute ones, but I love the black and green reversible one, 2 skirts in 1 awesome!! I would love to win the reversible khaki and pink! I like the swirl one! I would choose the khaki and pink skirt. The sirl skirt is cute! The diper and wipe holders are also very cute! I would choose the Black & White polka dot skirt! I like the reversible black and green skirt. I'd choose the reversible green/black! Great idea. I would choose the Reversible Brown and Blue Maternity Skirt. I like the reversible blue and brown. I'd pick the Lola Maternity Skirt in tan. 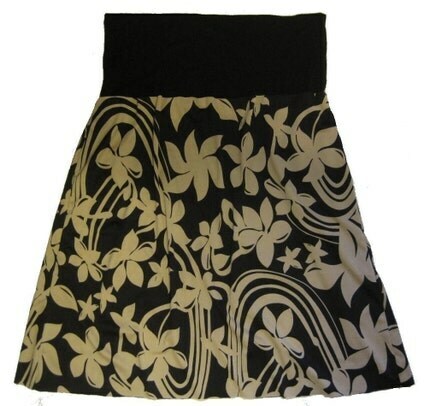 I'd hands down choose the Lola Maternity Skirt---Tan and Black Mod Floral Print! Christina - xristya@rock.com - I'd choose the Lola Skirt, it's lovely! My favorite is also the black & green skirt but the Lucy skirt is also nice. Cute! If I won, I would choose the Lola Maternity Skirt in Tan and Black Mod Floral Print. Thanks! If I won, I'd choose the Swirl Maternity Skirt. Blue and brown reversible! Love it! I would choose the Reversible Black and Green Maternity Skirt. I'd pick the Reversible Khaki and Pink Maternity Skirt---2 skirts in one---Professional and Fun. I like the reversible khaki and pink. I like the reversible black and green one you tried out! I would chose the Lola skirt. I love the skirt that you received...Reversible Black and Green Maternity Skirt. The green is so pretty. Thanks. I would choose the Reversible Black and Green skirt. Thanks! I'd love to get the pretty Lola Maternity Skirt for my pregnant sister!